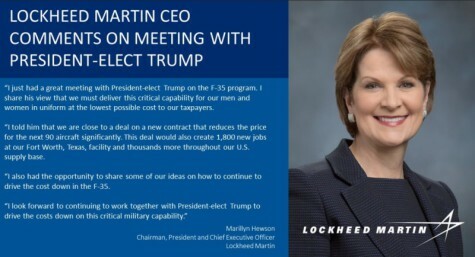 PARIS --- Lockheed Martin CEO Marillyn Hewson out-maneuvered US President-elect Donald J. Trump last week, deftly turning the tables on him to conclude a three-week skirmish about the cost and affordability of the F-35 Joint Strike Fighter. In a low-key maneuver which helps explain how she became chairwoman, president and chief executive of the biggest defense contractor in the world, Hewson first managed to recover unscathed from an initial faux pas after her first Dec. 21 meeting with Trump. In stark contrast with the CEO of Boeing, who on the same day cheerfully explained to reporters that he would accommodate Trump’s request for a much lower price tag for the two Air Force One presidential jets in development, Hewson declined to speak to reporters and instead issued a press release saying “I had a productive meeting with President-elect Trump this afternoon. I appreciated the opportunity to discuss the importance of the F-35 program and the progress we've made in bringing the costs down,” which is a rather offhanded way to respond to her largest single customer. This is probably when Lockheed Martin’s leadership was called to action stations. The specifics of the company’s internal processes are of interest only to management consultants, but however it played out the result was remarkably effective, as on Friday, January 13, Hewson fired off her own, twin-barreled response to Trump. In addition to the spoken message, there is also a subliminal one: this time, Hewson responded via Twitter, instead of by press release, thus sending Trump a clear message that she is on his same wave-length, that she is adapting to his customs and thus is not offering any resistance. But reality is far different, and here is how Hewson is, in fact, twisting Trump around her little finger. Lockheed faces two difficulties in negotiating future F-35 production contracts: first, the Pentagon’s Joint Program Office (JPO) is exerting pressure to lower costs, and for the last contract went as far as unilaterally imposing its own, lower price for Lot 9 production aircraft. Secondly, both Lockheed and JPO want to convince foreign partners and customers to sign a “block buy” contract for the next several hundred aircraft, which they claim would reduce unit costs by spreading production costs over a larger number of aircraft. This move is resisted by some, both in the United States and overseas, who are trying to keep the production rate as low as possible, to fix the F-35’s many technical faults and failings before spooling up production. “Block buy” is simply another name for “multi-year contract,” but only for foreign buyers -- the Pentagon cannot yet award one because the F-35 is still in the low-rate initial production phase. In fact, with her Jan 13 tweet, Hewson hoisted Trump with his own petard. The 1,800 “new jobs” at Lockheed Fort Worth plant are those that Lockheed had already planned, as it ramps up production rates from 57 aircraft in Lot 9 to 90 in Lot 10 (“the next 90 aircraft) she mentions in her tweet. So, by implying these are newly-inspired 1,800 jobs, she is in fact pandering to Trump’s very public negotiating tactics by pretending he has already scored a victory on this point. The only action that Lockheed has so far come up with to lower costs is multi-year contracts covering hundreds of aircraft at once. Hewson saw how she could use Trump’s very public demands for lower costs to Lockheed’s advantage: proposing a “block buy” which Trump would jump on. No matter that it would provide no benefit to the United States, because the main goal of the block buy is to produce as many aircraft as fast as possible to take the program securely beyond the point of no return. Trump now has no choice: he must be seen to pressure the Pentagon to stop wasting time award the Lot 10 contract “for the next 90 aircraft” as fast as possible, so Lockheed can start cutting costs. Delaying the Lot 10 contract would also be saying no to 1,800 new jobs, and that would be politically impossible. Trump also has precious little leeway with the “block buy”: he must accept the principle, and pressures allies and customers into signing one because, if he doesn’t, Hewson would simply say Trump’s not really interested in cutting costs, and doesn’t do what’s necessary to achieve them. So, either Trump does what Lockheed wants, and gets more jobs and lower costs to announce to voters and taxpayers. Or he doesn’t, and his Tweeter campaign is shown to be an empty gesture. This would also take the pressure off Lockheed’s top management, and show Trump to talk the talk, but not walk the walk. Today, only one real question remains: did Hewson hatch this strategy because she is of a Macchivellian disposition, or did she simply recover brilliantly from her initial error in treating with Trump? Either way, Lockheed wins -- as has been true since the program’s inception.